Texas taxpayers are still picking up the tab for defending the nation’s strictest voter identification law more than five years after Republicans fast-tracked it through the Legislature. More than five years after Republicans fast-tracked legislation limiting the forms of ID accepted to vote in Texas elections, state taxpayers are still picking up the tab for defending the nation’s strictest voter identification law in court. The state has spent more than $3.5 million defending the law in the five separate lawsuits it has spawned, records obtained from Texas Attorney General Ken Paxton’s office show. Whether that spending is a “shameful waste” or the cost of fending off the federal government depends on whom you ask. Paxton’s legal team is battling the U.S. Department of Justice, minority groups and other opponents who argue — thus far successfully — that Senate Bill 14, passed in 2011, discriminates against minorities, elderly and poor Texans most likely to lack acceptable government-issued IDs. Paxton, Gov. Greg Abbott and the law's backers say it was needed to protect the integrity of elections by preventing voter fraud, but opponents cite the paucity of proven voter fraud in the state and argue the intent was to disenfranchise certain voters. The state’s legal tab includes court fees, expert witnesses, outside lawyers, travel costs and state employees’ time spent working on the flurry of litigation the voter ID law triggered. The costs will only grow, with most new spending attached to Veasey v. Abbott, the primary lawsuit, which has been going for three years. The U.S. 5th Circuit Court of Appeals last month heard oral arguments in that case and is expected to rule by July 20. Voting experts say it’s one of two high-profile voter ID-related lawsuits, alongside a broader case in North Carolina that the U.S. Supreme Court may ultimately decide. Paxton’s cost estimates were current as of April. They do not include travel to New Orleans for the recent oral arguments (Paxton was among those who attended), or the month of preparation leading up to them. Under the law, Texas became one of nine states requiring "strict photo ID," according to the National Conference of State Legislatures, and the Lone Star State's seven-item list of acceptable forms of identification is the narrowest. Other states have defended voter ID laws in court. Wisconsin and Indiana, for instance, prevailed in cases that reached the U.S. Supreme Court. But Texas, in its particularly convoluted battles, has likely spent far more than those states, said Gerry Hebert, a prominent attorney who is helping plaintiffs in the Veasey case. “If I were a Texas taxpayer, I’d be outraged by how much money Texas is spending of my tax dollars to defend a discriminatory law,” Hebert added. Abbott, who was attorney general when the litigation began, considers the law worthy of defense, and his office blames the federal government for the need to spend money in court. “With numerous documented cases of voter fraud in Texas, it’s unfortunate that the Obama administration has chosen to waste millions of taxpayer dollars fighting a law already found to be Constitutional by the U.S. Supreme Court,” spokesman John Wittman said in an email. The Supreme Court has not weighed in on the constitutionality of SB 14. Thus far, lower courts have found it to be unconstitutional. Wittman later said he was referring to Supreme Court rulings on the Indiana and Wisconsin laws. The Texas law requires voters to present one of the following forms of photo identification at the polls: a Texas driver’s license, state personal identification card, state handgun license, U.S. military identification card, U.S. citizenship certificate or a U.S. passport. Experts have testified that roughly 600,000 Texans lack such identification, though not all have necessarily tried to vote. Those folks can obtain “election identification certificates” free of charge that would allow them to vote in-person, but only if they present a copy of their birth certificate. The law sailed through the Republican-dominated legislature in 2011, after Gov. Rick Perry declared it an “emergency item,” essentially fast-tracking the bill at a time when lawmakers were also debating how to plug a budget shortfall. The law’s journey through the legal system, however, has been more difficult — and expensive. It did not immediately take effect. At that time, the U.S. Voting Rights Act required states or counties with a history of discrimination to “pre-clear” changes in their election laws with the U.S. Department of Justice to ensure they did not disproportionally impact certain voting groups. While SB 14 was awaiting the pre-clearance decision, Abbott sued the federal government in Texas v. Holder, hoping a court would step in and speed up the process. That lawsuit cost taxpayers roughly $1.73 million, about half the tab for all voter ID-related litigation, according to the records from Paxton's office. That case became irrelevant in 2013, when the U.S. Supreme Court, in a separate case, threw out parts of the Voting Rights Act — including the pre-clearance requirement —and the Texas law kicked in. The law has remained in effect ever since, but it still faces a raft of legal challenges from the federal government, voting rights advocates and minority groups. So far, the law's opponents have scored notable legal victories, but it's expected that the U.S. Supreme Court will have the final say on SB 14's constitutionality. Most recently, in the Veasey case, a three-judge 5th Circuit panel ruled that the law had a “discriminatory effect on minorities’ voting rights." The August 2015 decision came one day before the Voting Rights Act turned 50 years old. 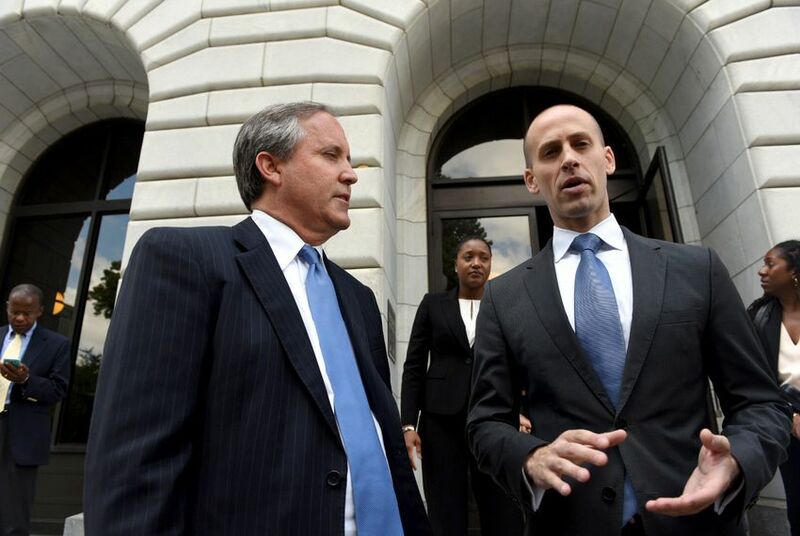 Texas has spent about $1.74 million defending itself in that lawsuit, Paxton's records show. Those costs could rise significantly, particularly if the state ultimately loses the case. If that happens, the plaintiffs will likely ask a court to make Texas pay their attorneys fees. That’s what happened in another complicated and pricey lawsuit that dates back to 2011: the state’s defense of its redistricting maps. Last August, an appeals court ordered Texas to pay the plaintiffs more than $1 million in fees for that case. The U.S. Supreme Court later declined to take up the state’s appeal. The state has spent more than $42,000 defending itself in three other lawsuits since S.B. 14 kicked in. Two of them, filed by the federal government and minority groups, have been consolidated into the Veasey case. Judge Larry Meyers, a Republican turned Democrat who sits on the Texas Court of Criminal Appeals, filed his own challenge in 2014. He withdrew the suit last May.